As a boy, I dreamed of adventure. I loved the swashbuckling tales of Treasure Island and The Count of Monte Cristo. I imagined what it might be like to be shipwrecked with the Swiss Family Robinson or sail alongside noble pirates such as Captain Blood or the Sea Hawk. When I first toured the U.S. Brig Niagara as a kid and learned the story of the Battle of Lake Erie, I was astonished. Who knew such adventure existed in reality — let alone on the lake that I swam in every summer? The story of the lake's battle had everything: swashbuckling heroes, swords and ships, thrilling captures and daring escapes. Nowadays, children and adults can still capture that sense of adventure right on our bayfront. When the Flagship Niagara League was created in 1982, their goal was to reconstruct the U.S. Brig Niagara into a sailing school vessel. In the years since, they have helped reinvigorate the bayfront with the ship along with operating the Erie Maritime Museum and, new this summer, collaborating with the South Street Seaport Museum of New York City to have a second ship in port, the Lettie G. Howard. The Lettie G. Howard is currently sailing seven days a week on the bay through September with both daytime and evening sails open to the public. The schooner was built in 1893 in Essex, Massachusetts as a commercial fishing vessel and today, much like the Niagara, it operates with a mission of conducting educational voyages. There are exciting things happening on the bayfront. One can sense the enthusiasm while touring the ships and speaking with those directly involved in the day-to-day operations. 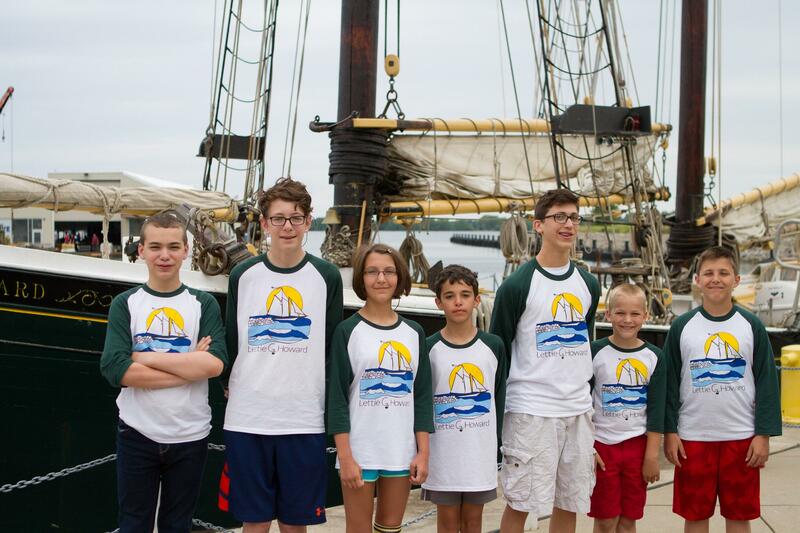 The Flagship Niagara League has always done sail training, but in recent years, they have worked hard to reflect that in their programming, reemphasizing their focus as a sail training organization. This is the first summer for their new Tall Ships Summer Camp, open to children between the ages of 10 and 14. "Now we have specific high school programs, we have specific college programs, we have opportunities for adults, and in creating the summer camp, it was taking what was only ages 14-and-up down to 10-and-up," Executive Director and Fleet Captain William Sabatini explained. The summer camp runs in one-week sessions through mid-August and is designed with an engaging and educational curriculum that includes various nautical activities such as knot-tying and building backpacks out of canvas and sailors thread. Campers go on two-hour sails on Lettie each day, applying their learned skills and getting an introduction to the uniqueness of maritime culture. "The camp is designed around character building and leadership training and this idea of the individual," Captain Sabatini said. "We really focus on giving them something meaningful as they go forward into life. It's still a summer camp, but it's a summer camp with a completely different focus." I toured the facilities (along with my four-year-old son, who kept wondering aloud when we were going to run into pirates) with Marcus Masternak. He had been a trainee on the Niagara's three-week sailing program back in 2007 — a remarkable experience for him where he ate, slept, and sailed on the ship — and after just shy of a decade, he was back, hired as the organization's Membership and Donor Services Manager. The day of our tour was a perfect Erie summer day — pristine blue skies, a cool breeze off the lake, the kind of day that makes one forget about the 200 inches of snow dumped on the city this past winter. It was during this record-breaking winter that the staff started to really explore the idea of a new summer camp for younger children. "This past January, the Tall Ships Summer Camp was just a concept," Marcus explained while we toured the two ships. By February though, the staff was working hard to turn that concept into a reality. "Our staff really gels a lot as a team." I asked how they ended up getting the Lettie in the first place. "We'd been searching for about three years for another vessel — one that was smaller, one that had a different rig style, one that maneuvered better, and one we could do shorter day sails on," he recounted. The vision that the South Street Seaport Museum had with the Lettie aligned seamlessly with that of the Flagship Niagara League. The day of my tour was their first day for the third session of summer camp. There were about a dozen young boys and girls between the ages of 10 and 14 and, when I first saw them, they were getting ready to descend to the rig shop to begin tying their first knots — a lesson in learning the ropes. I watched as the kids enthusiastically tied knots as my own son ran around trying to figure out what in the world they were doing. Marcus handed him his own rope to carry around. We navigated through the areas generally not toured that keep the Niagara — and now the Lettie G. Howard — operating. Seeing this, it is very clear how much work goes into keeping such ships operational. He showed the fully-functional woodshop where any part of the Niagara can be recreated and replaced. We walked through the rig shop. He explained how paid and volunteer staff work all winter do all the sanding, staining, and painting. The Flagship Niagara League is also working to continue their outreach, Marcus stressed, connecting more with the community and local schools and organizations. I noted the increase in their use of social media over the past year or two, which he confirmed was a deliberate strategy to help demonstrate to the community everything that they offer. Their programming continues to expand as well. There are numerous sailing programs beyond the summer camp: a tuition-free rigging practicum, a 10-day all-ages sea trial program, a college-level program (with potential earned credits) that focuses on square-rig seamanship and public history. There's a summer program for teenagers that includes sailing to Put-in-Bay, Ohio for its annual maritime festival. Scholarships are even available for trainees in need to offset costs thanks to private donors and local businesses. Perhaps the most exciting prospect for next year though is their semester-long Tall Ship Academy, which aims to operate from February 3 through June 1 aboard the Lettie G. Howard. High school students who enroll will sail over 5,000 nautical miles over four months, beginning in the Caribbean and sailing into over 20 ports beginning in the U.S. Virgin Islands and working up the Atlantic Coast before sailing their way through the lakes back to Erie. Students will also earn credits, taking flexible online courses while also participating in numerous historical and cultural excursions throughout their various stops. The experience is unprecedented in Erie and, for adventure seekers, an opportunity of a lifetime. The staff have a clear passion for not only the ships and the lake and the history — but also the city of Erie itself. The bayfront has changed substantially over the last decade alone and over the next decade will continue to transform with the construction of Harbor Place and Bayfront Place. "My whole thing is trying to get people to look at their city differently," Captain Sabatini added. "I want people to look from the water back at Erie and look up the hill, rather than always looking down the hill at the water. I think that when you look at the city that way, as being a waterfront city that was built from the water up, it really changes how you interact with the city." As this transformation occurs, the Flagship Niagara League plans to be there — and, I can only hope, will be the centerpiece. That will require the community to continue to support and engage with their programming. Captain Sabatini stressed the importance of this local support. "The publicity is good, but if nobody comes down to actually interact with what we've brought here, it can go away. The Erie community and the greater community around here have to engage with what we're doing to make the waterfront better — send their kids to summer camp, come down and go sailing on the Lettie G. Howard. If we want our waterfront to develop, we also have to be the ones to come down and use it." If you're ready for some adventure, you can find more information at www.flagshipniagara.org, their Facebook page, or by sending an email to sail@flagshipniagara.org.